Experience the excitement of urban living wrapped in the style and sophistication of the Historic Dilworth neighborhood. Neighboring South End, Camden Dilworth offers one, two and three bedroom apartments with a coveted address minutes from Uptown Charlotte. No need for a car when you want to explore. Our apartments are just two blocks from the exciting shopping and dining options on East Blvd. You can even walk to Harris Teeter! Camden Dilworth apartment homes boast features that pull in the craftsman style architecture Dilworth is known for so when it’s time to stay in, you won’t be disappointed. Each home features custom shaker style wood cabinets, granite countertops, slate tile backsplash, stainless steel appliances, California styled closets and washer and dryer included. Camden Dilworth offers great amenities like a 24-hour fitness studio with circuit training and rooftop terrace with WiFi and outdoor fireplace. Camden Dilworth apartments feature conveniences like reserved parking, valet dry cleaning and doorstep trash pickup. We’re pet-friendly and within walking distance to Freedom and Latta Park making it easy for your pet to get exercise. Gorgeous parks and historic homes are surrounded by walkable shopping, dining and entertainment venues. Enjoy the comfort of an upgraded apartment home set amid Charlotte’s historic Dilworth neighborhood. We’re nestled between SouthPark and Uptown, putting the best Charlotte has to offer right at your fingertips. Stop waiting and start living – come home to Camden Dilworth today! We'll save a spot for you! We offer up to one parking space per lease holder in our parking garage for $10 per month. Additional reserved spaces are $40 per space, per month. Contact Leasing Office for details. 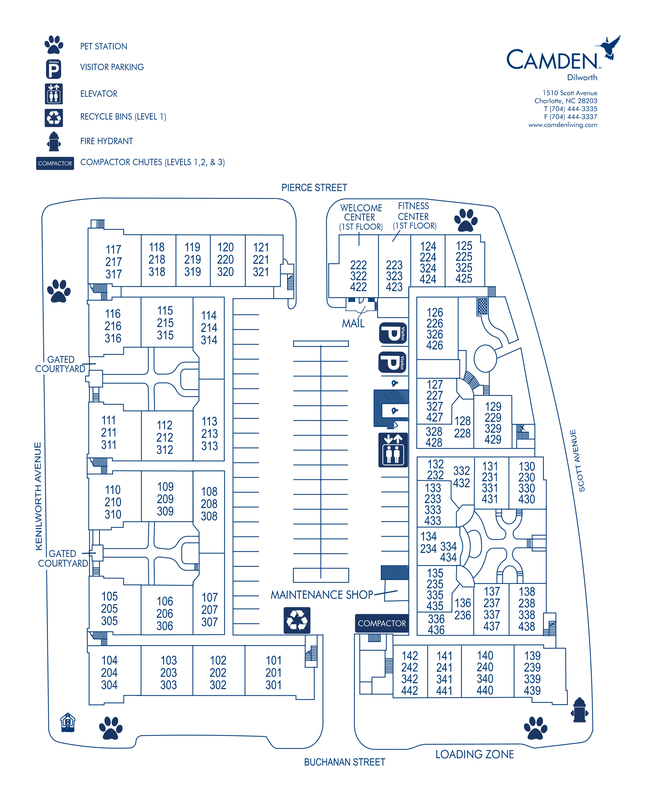 We have additional parking for visitors in our parking garage on a first-come, first-served basis.